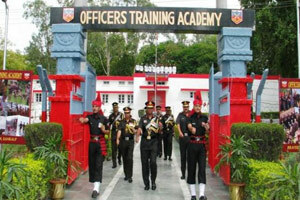 Officers Training Academy, Chennai trains Men and Women Cadets to join the Indian Army as Officers for the Short Service Commission (SSC). It was established in 1963 as OTS and was renamed OTA in 1985. The first Women Officers batch was conducted in 1992. Fee Concession of Rs. 1,000/- for Serving Soldiers and Wards of Ex-Servicemen, Retired Defence, Para Military Forces and Police Forces & Students of Sainik / Military Schools. Fee Concession of 70% for Wards of Martyrs of Armed Forces. Note: 1/3 Negative Marks for each wrong answer are deducted. One can appear for CDS Exam, when he/she is appearing for 3 rd year of Graduation. Both Male and Female can apply for CDS Exam. Female candidates can only apply for Short Service Commission i.e. OTA. CDS Exam has three papers i.e. English, GK & Maths for Permanent Commission i.e. IMA, AF & NA and two i.e. English & GK for candidates applying for Short Service Commission i.e. OTA. Candidates with Arts/Commerce background are eligible for ARMY only. The Cavalier, provides a Comprehensive One Month (180 hours) and two months (340 Hours) written coaching and has achieved the best success rate. The exam starts at 9 a.m. and winds up at 5 p.m. on the same day. Most college students lack mental physical stamina to sit for almost 8 Hours. So, build it up and be prepared for long hours. CDS Mathematics: The standard of Mathematics paper will be of Matriculation level. Total 100 questions. Therefore, a student gets about a minute plus to solve each question. It is essential for candidate to practice shortcut techniques, At Cavalier all possible short cuts are taught and practiced in detail. General Knowledge: The syllabus for the General Knowledge paper is very vast and generic. Analyzing the past five years papers would help or else, you may focus on unnecessary, bulky details that are difficult to comprehend and remember. For example, in History one needs to drastically cut down effort on Ancient and Medieval History. The Cavalier, provide students with Sample Paper and recent Current Affairs Notes prior to the Exam Day. English: The English paper is often ignored by candidates who speak reasonably good English. They however, forget that spoken English is quite different from the Pure Application of Correct Grammar in Objective Type Questions. Those candidates who revise and practice the Basic English Grammar sufficiently can secure almost 100% marks in the grammar section, which is almost 70% of the paper. UPSC gets innovative and at times asks you to indentify the wrong statements too. So be prepared for surprises. The remaining 30% paper comprises Comprehensions, Antonyms, Synonyms, Analogy. The candidates usually spend a lot of time on this section. It is very difficult to mug up Antonyms and Synonyms; this is something that one builds over a period of time. The Cavalier teaches you some innovative techniques to solve your paper in a short span of time. WHAT DOES CAVALIER OFFER ? A great place for ssb guidance , defense veterans are really helpful.